China has announced it is increasing its loans for African countries by $10 billion, bringing the total to $30 billion, and will also expand the China-Africa development fund by $2 billion to $5 billion. Chinese Premier Li Keqiang outlined China’s Africa policy in an address at the African Union headquarters on Monday. 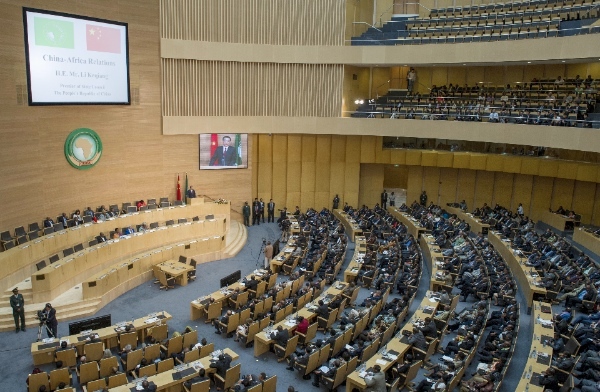 1,500 dignitaries from the AU and international organizations listened to the address at the AU Convention Center. The Chinese government will also provide Africa with $10 million dollars of free aid for wild life preservation and promoting joint research in protecting biological diversity, said Li. China-Africa trade reached $210.2 billion in 2013. China and Africa will now aim to bring the volume to $400 billion by 2020 and push China’s cumulative direct investment in Africa towards $100 billion. Li vowed to expand cooperation with Africa in building road, rail, telecommunications, power grid and other infrastructure and will encourage Chinese enterprises to form joint ventures with African counterparts in a bid to improve Africa’s regional aviation industry. Responding to queries on the threat to peace in the continent, Li said Beijing “supports Africa to solve African problems in the African way” and “stands ready to assist Africa’s capacity-building in such areas as peace-keeping, counter-terrorism and anti-piracy”. Li also announced another 50 million yuan (about $8 million) of humanitarian aid to help deal with the crisis in South Sudan.